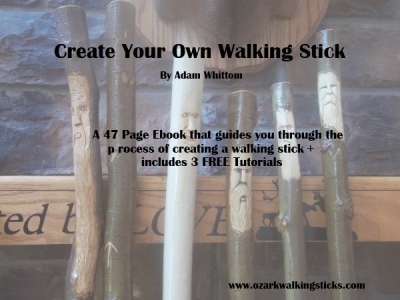 Creating your very own walking stick is a project that anyone can do, from young to old (Note: Adult supervision is highly recommended). The entire process is an experience that will provide a feeling of satisfaction and accomplishment in the end. When you look back at the journey from planning to completed project, you will be amazed at what you have learned and created. You will have all the information that is necessary to build upon this foundation and start making your own walking sticks. Believe me, as the walking stick process takes shape, you will be planning the next one before you even get the first one done. I will warn you now; once you start making walking sticks, you won’t want to stop. What are you waiting for? Get your own copy right now!